When I was a kid, I always wanted to try and grow a giant pumpkin—like those you see at the Fair. I grew up in Ohio where, almost every year since 1903, they’ve held an enormous pumpkin festival. The four-day festival can attract as many as 300,000 people. The largest pumpkin ever entered weighed 1,964 pounds! 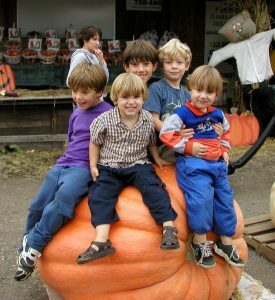 Kids have fun with giant pumpkin. 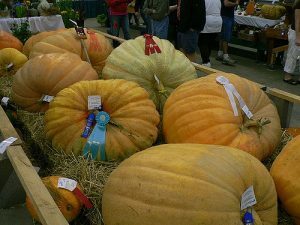 Maybe you’d like to try and grow a giant pumpkin and enter it in the Mountain State Fair this fall. If so, you’ll need to start now! 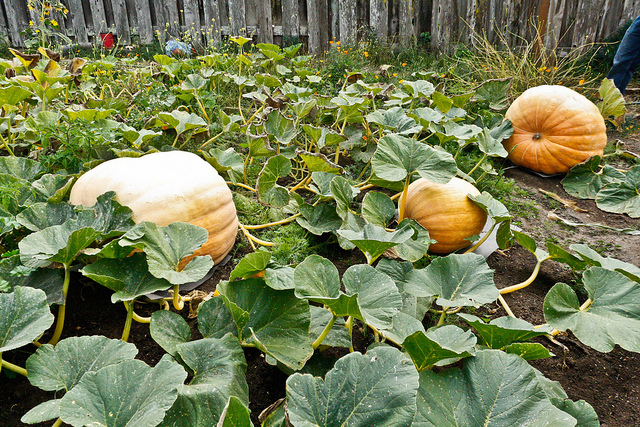 Buy seeds sold to produce giant pumpkins—with “giant” or “max” in their name. Plant pumpkin seeds indoors near the end of April. Or sow seeds in the ground in mid- to late-May once the dirt has warmed up and the danger of frost is over. To start your seeds indoors, fill a quart-sized pot with potting soil. Plant 3 seeds in the pot, water thoroughly, and place the pot in a sunny window. Once the plants have sprouted and have 3 to 4 leaves each and danger of frost has passed, you can transplant them outside. To start your seeds outdoors, pick a sunny location where your pumpkin vines will have lots of room to grow. Dig a hole in the ground 1 foot deep and 2 feet wide. Mix compost or aged manure in with the loose dirt from the hole. Make a mound—or hill—from your loose dirt pile. Plant 3 or 4 seeds in the hill and water thoroughly. The seed packet instructions will tell you how deep to plant the seeds. To transplant seedlings from indoors to outdoors, prepare planting hills and gently place one seedling in each hill. Plant just deep enough for the dirt to cover the roots. Thinning. Once each plant in the hill has 3 to 4 leaves, choose the largest and strongest plant to save. Then cut the others down to the ground. Do not pull the cut plants out of the ground because you might damage the roots of your biggest plant. Watering. Do not let the hill totally dry out. Keep the soil moist but not soaking wet. Fertilizing. Fertilize your plant every two weeks. Look for a fertilizer that mixes with water and has “10-10-10” on the label. Don’t over-fertilize! Protecting. You may need to protect your seedlings from late frost or very chilly nights. A gallon milk jug works nicely. Cut the bottom off and place the jug over each seedling. Be sure to remove the jug the next morning or the plant may get too hot. Watch out for disease and insect pests, too! Have an adult read about possible problems and how to prevent or treat them. Getting bigger and bigger! Once your plant has 4 to 5 small pumpkins, pinch off all the other blossoms and all vine tips. 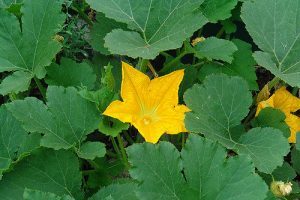 This lets the plant put all its energy into growing the remaining pumpkins—and keeps the pumpkin plant from sprawling all over your yard and garden. When your pumpkins are about the size of a softball, it is time to choose just one to keep. Cut the extra pumpkins off their stems. Be careful not to damage the vine! The vine provides water and nutrients to your pumpkin while it grows. Helping hand. 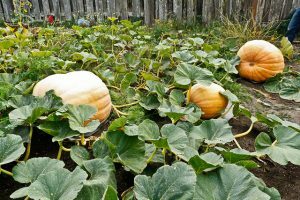 As your pumpkin grows, it will want to flatten out where it touches the ground. This is normal. You can help the pumpkin keep its round shape by gently rotating it every couple weeks. This must be done very carefully so you don’t damage the stem! Harvest your pumpkin when it stops growing—3 ½ to 4 months after you planted the seed. With clippers or a small saw, cut the stem about six inches above the pumpkin. If you accidently knock the stem off, the pumpkin will start to rot! Giant pumpkins at the Fair win ribbons! Do you think you’ve grown a prize pumpkin? If so, make plans to enter it in the Mountain State Fair in September. The judges might award you—and your giant pumpkin—a blue ribbon! Article written by Nancy Good, Extension Master GardenerSM Volunteer.